Diabetes was type 2. MetS indicates metabolic syndrome. American Diabetes Association. Data from the National Diabetes Statistics Report, 2015 (released June 10, 2014). http:/www.diabetes.org/diabetes-basics/statistics/. Accessed August 7, 2016. Question What is the long-term clinical utility of coronary artery calcium scores for cardiovascular disease prognostication in those with established metabolic syndrome and type 2 diabetes in a multiethnic population? Findings Coronary artery calcium scores had significant long-term (>10 years) value in prognosticating cardiovascular disease in patients with metabolic syndrome and diabetes. A coronary artery calcium score of 0 was associated with low cardiovascular disease risk independent of diabetes duration, insulin use, or glycemic control. Meaning Assessment of subclinical disease using coronary artery calcium scores may have robust long-term value in prognosticating cardiovascular disease even in those who had diabetes for more than 10 years from the time of coronary artery calcium scoring. Importance Although the risk of type 2 diabetes is considered to be equivalent to coronary heart disease (CHD) risk, there is considerable heterogeneity among individuals for CHD and atherosclerotic cardiovascular disease (ASCVD) risk. It is not known whether coronary artery calcium (CAC) assessment at baseline in individuals with established metabolic syndrome (MetS) or diabetes identifies CHD and ASCVD prognostic indicators during a long follow-up period. Objective To compare improvement in long-term prognostication of incident CHD and ASCVD using CAC scores among those with diabetes, MetS, or neither condition. Design, Setting, and Participants This study included participants from the Multi-Ethnic Study of Atherosclerosis (MESA), a prospective cohort study of 6814 males and females aged 45 to 84 years without known CVD from 4 race/ethnicity groups (white [38.5%], African American [27.5%], Hispanic [22.1%], and Chinese [11.9%]) recruited from 6 US communities from July 2000 through August 2002. Follow-up for each participant extended to the first occurrence of an incident event, other death, loss to follow-up, or the last follow-up call through December 31, 2013. Data analysis was performed from June 1, 2016, to September 12, 2017. Cox proportional hazards regression models were used to estimate hazard ratios (HRs). Area under the receiver operator characteristic curve and net reclassification improvement were used to compare incremental contributions of CAC score when added to the Framingham risk score, ethnicity/race, and socioeconomic status. Main Outcomes and Measures CHD events, including myocardial infarction, resuscitated cardiac arrest, or CHD death. Results Of 6814 MESA participants, 6751 had complete risk factor and follow-up data and were included in this study (mean [SD] age, 62.2 [10.2] years; 3186 [47.2%] male). A total of 881 (13.0%) had diabetes, 1738 (25.7%) had MetS, and 4132 (61.2%) had neither condition. After 11.1 mean years of follow-up, CHD events occurred in 84 participants with diabetes (135 ASCVD events), 115 with MetS (175 ASCVD events), and 157 with neither (250 ASCVD events). The CAC score was independently associated with incident CHD in multivariable analyses in those with diabetes (HR, 1.30; 95% CI, 1.19-1.43), MetS (HR, 1.30; 95% CI, 1.20-1.41), and neither condition (HR, 1.37; 95% CI, 1.27-1.47). For incident CHD, net reclassification improvement with addition of CAC score was 0.23 (95% CI, 0.10-0.37) in those with diabetes, 0.22 (95% CI, 0.09-0.35) in those with MetS, and 0.25 (95% CI, 0.15-0.35) in those with neither condition. The CAC score was also a prognostic indicator of CHD and ASCVD after controlling for diabetes duration of 10 years or longer at baseline, insulin use, and glycemic control. Conclusions and Relevance In a large multiethnic cohort, the addition of CAC score to global risk assessment was associated with significantly improved risk classification in those with MetS and diabetes, even if diabetes duration was longer than a decade, suggesting a role for the CAC score in risk assessment in such patients. Although the risk of diabetes is considered to be CHD risk equivalent, studies10,15 have found that there is heterogeneity among individuals for CHD and ASCVD risk. Although studies16-19 examining the prognostic significance of CAC in diabetes have found an association of CAC with CHD and CVD events, these analyses16-19 have not focused on reclassifying individuals with diabetes and MetS into lower- or higher-risk groups for long-term CHD and CVD risk. We investigated the utility of CAC scores in reclassifying asymptomatic individuals with diabetes and MetS and the association of CAC scores with long-term risk prognostication in a multiethnic, population-based study. In addition, we examined whether other factors, such as duration of diabetes, are associated with risk prognostication to aid in clinical decision making regarding screening for subclinical disease in patients with diabetes. We included participants from the Multi-Ethnic Study of Atherosclerosis (MESA), a prospective cohort study of 6814 men and women aged 45 to 84 years without known CVD from 4 race/ethnicity groups (white [38.5%], African American [27.5%], Hispanic [22.1%], and Chinese [11.9%]) recruited from 6 US communities from July 2000 through August 2002. Details of the MESA study design have been previously published.20 Written informed consent was provided by MESA study participants. The aggregated data were deidentified. The University of California, Irvine Institutional Review Board granted permission for analyses of the deidentified data. The CAC score was measured using cardiac-gated electron-beam or multidetector CT, and details of scanning acquisition have been published previously.21 The CAC scores were based on the mean results from 2 scans and adjusted using a standard calcium phantom for calibration. Any detectable calcium was defined as a CAC score greater than 0. We log-transformed the CAC score (lnCAC score) as ln(CAC+1) to maintain the normality of CAC measures. The CAC scores were also categorized as 0, 1 through 99, 100 through 399, and 400 or greater and dichotomized as 0 or greater than 0. At intervals of 9 to 12 months, a telephone interviewer inquired about interim hospital admissions, cardiovascular diagnoses, and deaths. An adjudication committee received copies of all death certificates and medical records for hospitalizations and outpatient cardiovascular diagnoses and conducted next-of-kin interviews for out-of-hospital cardiovascular deaths for verification. Our primary end point was incident CHD events, including myocardial infarction (defined by a combination of chest pain, abnormal electrocardiographic findings, and cardiac enzymes abnormalities), resuscitated cardiac arrest, or CHD death; the secondary end point included incident ASCVD events, including incident CHD events and fatal or nonfatal stroke. Follow-up for each participant extended to the first occurrence of an incident event, other death, loss to follow-up, or the last follow-up call through December 31, 2013. Data analysis was performed from June 1, 2016, to September 12, 2017. Descriptive data are presented as mean (SD) for continuous variables and number (percentage) of participants for categorical variables. For each disease group, CHD and ASCVD incidence rates per 1000 person-years were calculated as incident event number per person-time at risk according to CAC score categories. Cumulative CHD and ASCVD survival rates for CAC score categories stratified by diabetes duration, glycemic control (hemoglobin A1c≤7% vs >7% [to convert to proportion of total, multiply by 0.01]), and insulin use were calculated with the Kaplan-Meier estimator and compared with the log-rank statistic. Cox proportional hazards regression was used to calculate hazard ratios (HRs) for 10-year estimated incident CHD and ASCVD risks, separately for each disease category, comparing FRS (or ASCVD risk score for ASCVD) with CAC score (with continuous CAC, lnCAC, and categorical CAC scores). Because hemoglobin A1c measurements were not available at baseline but were available in examination 2, we performed secondary analyses with hemoglobin A1c levels, diabetes duration, and insulin use in the model along with our other predictors. Interaction terms of CAC were used to examine for heterogeneity of effects by disease group and within those with diabetes by diabetes duration (≥10 vs <10 years) and insulin use. Up and down denote reclassification into higher- and lower-risk categories, respectively. P(event|up), P(event|down), and P(event) were calculated from the Kaplan-Meier estimate of 10-year event risk. Means were compared using analysis of variance, and proportions were compared between disease groups using the χ2 test. A 2-sided P<.05 (P < .10 for interaction test) is considered to be statistically significant. All statistical analyses were performed using SAS software, version 9.3 (SAS Institute Inc). Of 6814 MESA participants, 6751 had complete risk factor and follow-up data and were included in this study (mean [SD] age, 62.2 [10.2] years; 3186 [47.2%] male). At baseline, 881 (13.0%) had diabetes, 1738 (25.7%) had MetS, and the remaining 4132 (61.2%) had neither condition. Those with diabetes tended to be older and were more likely male, African American, and Hispanic with poorer cardiovascular risk factors. Those with vs without MetS also had worse risk factors (Table 1). Those with diabetes also reported substantially higher use of lipid-lowering medications (244 [27.7%]) compared with those with MetS (319 [18.4%]) and those with neither condition (529 [12.8%]). Among the study participants, 329 (37.3%) of those with diabetes (similar in those with or without MetS), 779 (44.8%) of those with MetS, and 2272 (55.0%) of those with neither diabetes nor MetS had a CAC score of 0. During a mean (SD) follow-up time of 11.1 (3.0) years (median, 12.2 years), CHD events occurred in 84 participants with diabetes (135 ASCVD events), 115 with MetS (175 ASCVD events), and 157 with neither diabetes nor MetS (250 ASCVD events). Figure 1 shows the incidence rates of CHD and ASCVD according to CAC score categories in each disease group. In each group, a stepwise increase in observed CHD and ASCVD events was seen with increasing severity of CAC score categories. For those with diabetes but no CAC, the CHD event rate was 3.7 per 1000 person-years. The CHD and ASCVD event rates were comparable between those with diabetes for less than 10 years and those with diabetes for 10 years or more for all CAC score categories unless the CAC score was 400 or greater, in which case event rates were higher (eFigure 1A in the Supplement). Insulin use was reported by 117 patients with diabetes (13.3%)at baseline, and the association among event rate, CAC score category, and use of insulin was inconsistent; however, in the CAC score of 400 or higher category, insulin use was associated with higher event rates (eFigure 1B in the Supplement). There was no consistent association among glycemic control, CAC category, and event rate (eFigure 1C in the Supplement). Among those with diabetes and the highest FRS category of greater than 20%, the CHD event rate was not high if the participant had a CAC score of 0 (4.7 per 1000 person-years) (eFigure 1D in the Supplement). Only at a PCE annual risk of 15% or greater did the event rate among those with diabetes and a CAC score of 0 increase to more than 7.5 per 1000 person-years (eFigure 1D in the Supplement). The presence of MetS along with diabetes was also associated with increased event rates (eFigure 1E in the Supplement). Kaplan-Meier analyses (Figure 2) revealed that patients with a decade or more of diabetes at baseline had a greater number of CHD and ASCVD events. In those with a CAC score of 0, the event rate was similar for those with diabetes for a decade or more compared with those with a shorter duration of diabetes. The severity of CAC was more accurate compared with the duration of diabetes. We also examined insulin use and CAC scores; those taking insulin had higher event rates compared with those taking oral medications only (eFigure 2 in the Supplement). Poor glycemic control was associated with higher event rates for every CAC score category (eFigure 3 in the Supplement). Compared with those with a CAC score of 0, the HRs for CHD and ASCVD events increased progressively with higher CAC categories; those with CAC scores of 400 or higher had the highest HRs for CHD events (HR, 5.60; 95% CI, 2.79-11.23, among those with diabetes) (Table 2). In the subgroup of participants with diabetes in whom diabetes duration, hemoglobin A1c level, and insulin use were available, the HRs additionally adjusted for these disease severity markers were similar to those of the main analyses, demonstrating the robustness of our findings (Table 2). Among patients with diabetes, the adjusted HR associated with a CAC score of 0 was 0.35 (95% CI, 0.15-0.80) for CHD events and 0.43 (95% CI, 0.27-0.81) for ASCVD. We also tested the interaction term for CAC and DM duration as well as CAC and insulin use, and these interactions were not statistically significant (eTable 1 in the Supplement). Measures of discrimination revealed a significant improvement with inclusion of CAC score in the prediction model across all disease groups (eTable 2, eTable 3, eFigure 4, and eFigure 5 in the Supplement). In the diabetes group, the NRI was 0.23 (95% CI, 0.10-0.37; P < .001) (eTable 3 in the Supplement). Reclassification of risk using CAC score (model 2) in the MetS group revealed a total NRI of 0.22 (95% CI, 0.09-0.35), whereas those with neither diabetes nor MetS had a total NRI of 0.25 (95% CI, 0.15-0.35). Category-free NRI captured any change of risk increase or decrease in event and nonevent subsets and produced highly significant results in all 3 disease groups when comparing the addition of CAC score with FRS and PCE alone; these estimates ranged from 0.56 to 0.65 for CHD events and from 0.45 to 0.56 for ASCVD events (eTable 3 in the Supplement). Our results indicate that evaluation of subclinical atherosclerosis with CAC scoring identifies downstream CHD and ASCVD events more than a decade after screeening has been done regardless of the presence of diabetes or MetS. Coronary artery calcium scores can be used to identify lower- and higher-risk individuals with MetS and diabetes. Many individuals with diabetes are at lower CHD and ASCVD risk than is widely understood and are not at high risk or CHD risk equivalents. Our results also indicate that CAC scoring adds significant clinical utility in further stratifying and reclassifying risk in persons with MetS and diabetes beyond global risk assessment using the FRS or ASCVD Pooled cohort risk score. Moreover, we found that the severity of CAC appears to be a more important clinical prognostic indicator than measures of disease severity, such as insulin use, glycemic control, and diabetes duration. Although many prior studies11,12,16-19 have excluded those with diabetes based on assumptions that diabetes already confers CHD risk equivalence, our findings indicate that 44.8% of those with MetS and 37.3% of those with diabetes have no evidence of CAC at baseline, associated with observed 10-year CHD event rates of only 2.3% among those with MetS and 3.7% among those with diabetes. Thus, the “warranty period” of a CAC score of 0, as previously discussed,27,28 can be extended to 10 years in those with MetS or diabetes. Moreover, in our adjusted analyses, a CAC score of 0 was associated with low CHD and ASCVD risk among those with diabetes that was independent of diabetes duration, insulin use, or glycemic control. Our analysis indicates that the presence and extent of CAC are more associated with ASCVD risk than is diabetes duration. Even among patients with long-standing diabetes, the absence of CAC was associated with similar low risk of events as among those with shorter duration of diabetes. Although diabetes is known to accelerate the aging process, future studies need to focus on the factors that provide resilience among patients with lack of subclinical disease despite long-standing diabetes. Our results extend the findings of prior publications11,12 that have reported the clinical utility of CAC scoring, indicating that after a decade of follow-up, there is no decrement in the NRI among individuals without diabetes. Among those with diabetes, when we compared CAC scores with FRS and PCE for prognostication of long-term events, almost half of these individuals were reclassified to a different risk group. Yeboah et al34 reclassified CHD risk exclusively among those with diabetes after a follow-up of 8.5 years, combining data from a subset of participants in MESA and the Heinz Nixdorf Recall Study, who in addition to CAC scoring had undergone assessment of carotid intimal media thickness, measurement of ankle brachial index, and C-reactive protein testing. Their observed NRI was 0.19 despite use of more prognostic indicators than CAC score alone compared with FRS, which could be attributable to the shorter follow-up period requiring estimation vs measurement of 10-year CHD event rates. Valenti et al35 also examined long-term risk prognostication for all-cause mortality using CAC scores in 810 individuals with diabetes from a single-site cohort. They reported a category-free NRI for all-cause mortality of 0.50 to 0.53 among those with diabetes, which is similar to our results for CHD events. However, that analysis did not adjust for markers of diabetes severity or duration. Our results support the clinical utility of CAC scoring in those with diabetes and MetS. Currently, CAC imaging has a class IIb recommendation in the 2013 ASCVD risk assessment guidelines.39 In addition, the Imaging Council of the American College of Cardiology recently concluded that CAC screening is the most sensitive noninvasive risk stratification tool among asymptomatic persons with diabetes.40 Although screening for CHD in patients with diabetes has previously been found to not be of benefit in reducing CHD and ASCVD events,41,42 other reports43-45 have found that patient awareness of an abnormal CAC score and coronary CT angiography results is associated with increased adherence to preventive therapies, lifestyle changes, and improvement in lipid levels and other risk factors, suggesting that CAC screening might help to support behavioral modification. In addition, Nasir et al46 found that CAC screening in MESA participants without diabetes can help identify those at adequately high risk who would benefit from statin therapy (and those at low risk who would not benefit). Whether asymptomatic patients with or without diabetes will have lower cardiovascular event rates from targeting statin use or intensity according to the presence of subclinical atherosclerosis has yet to be determined. 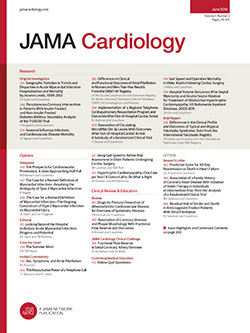 Future research should examine whether newer antidiabetic medications, such as sodium glucose cotransporter 2 inhibitors or glucagonlike peptide 1 receptor agonists, that benefit patients with known ASCVD could be considered for those at increased risk based on extent of CAC or other measures of subclinical atherosclerosis. Prospective studies that focus treatment intensity on objective measures of subclinical atherosclerosis may improve personalization of preventive therapies. Corresponding Author: Shaista Malik, MD, PhD, MPH, Division of Cardiology, Department of Medicine, University of California, Irvine, 333 West City Dr, Orange, CA 92868 (smalik@uci.edu). Accepted for Publication: September 21, 2017. Author Contributions: Dr Malik had full access to all the data in the study and takes responsibility for the integrity of the data and the accuracy of the data analysis. Study concept and design: Malik, Budoff, Nasir, Wong. Drafting of the manuscript: Malik, Zhao, Nasir, Wong. Statistical analysis: Zhao, Nasir, Wong. Obtained funding: Malik, Budoff, Nasir. Administrative, technical, or material support: Malik, Nasir. Study supervision: Malik, Budoff, Nasir, Blumenthal. Funding/Support: The Multi-Ethnic Study of Atherosclerosis (MESA) was supported by contracts N01-HC-95159 through N01-HC-95169 from the National Heart, Lung, and Blood Institute (NHLBI). Dr Malik is supported by grant R01 HL 128801 from the NHLBI. Additional Contributions: We thank the other investigators, staff, and participants of the MESA study for their valuable contributions. A full list of participating MESA investigators and institutions can be found at https://www.mesa-nhlbi.org.